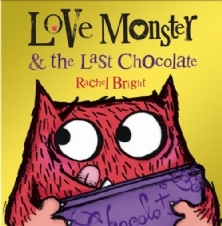 Rachel Bright is the creative force behind the Love Monster series and she will be visiting Harrogate Children’s Festival on Thursday 29th May. Expect stories, crafts and lots of fun as the Love Monster heads into town. We’re intrigued to hear that you’ve got such varied talents, having worked as an author, illustrator, printmaker and designer. Are you leaning towards one of your creative outlets more at the moment or are you busy juggling them all? I think if you’re a naturally curious and creative person, finding new ways to express your ideas is part of what keeps those ideas interesting. Words, pictures, designs – I sort of couldn’t imagine one discipline without the other – they all go hand in hand to me – and used in combination the results can be wonderful. This is why I love picture books so much – it’s a unique interplay of language and image. I bow to the great polymaths through history who blended science, arts and philosophy to discover new things. It’s such a liberating thing not to label yourself as one thing or the other and instead do what flows most naturally each day. The thing that’s most important to me is to keep looking at the world with wonder, to keep learning and to keep doing ALL the things that make my heart sing. Sometimes I feel like I’d need a thousand lifetimes to try all the things I want to try! Is it really true that you once had a date with Mr Tahiti? How did this come about and was there a second date? This question made me smile. Life is full of serendipity and happenstance – especially when you expect it to be. This was one of those crazy things (a good while ago now!) that you think never happen to anyone – but I actually won a competition through Marie Claire magazine to go on a date with one of the ‘The world’s most eligible bachelors’! They featured three ‘Men of the Millennium’ and, well, Mr Tahiti picked me! I was flown out to Polynesia with 3 days notice and had a whirlwind week of the most incredible experiences. The article came out the following January. It was called ‘A date with fate’! Considering we lived in different hemispheres, the chances of a second date weren’t really stacked in our favour, but I made a great friend and had the experience of a lifetime. Another magical happenstance. I had long dreamed of getting my own book published one day and had carried the idea around in my heart for quite a while without really knowing how to do it. 6 years ago, I decided to take a masters degree in Printmaking in Bristol where I was living at the time. It was incredible. Learning all these new etching and silkscreening and letterpress techniques breathed new life and light into my work. Towards the end of the course, I put some of my prints into a little exhibition. As fate would have it, the head of commissioning new talent at Puffin just happened to live around the corner from that exhibition and just happened to pop in. When I got back later that day, her card waiting for me, with a note asking me to get in touch. I couldn’t believe it. 8 months later I was sitting in their office in Penguin offices in The Strand being offered a 2 book deal. And the rest is history. I’ve been pinching myself ever since. What inspired you to create the charming Love Monster? Love Monster came from a very pure place. I literally woke up with the idea, fully formed at 5am in the morning, shortly after moving down to Dorset. I had to rush down the stairs of our little cottage and get it down on paper before it evaporated into the day. There he was, all googly-eyed and slightly hairy on the page and I just knew he was something special for me. That first story remained almost unchanged through the whole book-making process (which is quite unusual as there is often much tweaking to be done). I was over the moon with the finished thing. His other adventures flowed very naturally from there. Love Monster sort of represents the inner voices in us all – the learning we all go through in life and the journeys we all have to take. The stories are about universal experiences and emotions: Gratitude, Fear, Togetherness & Love. Are you planning to write more books in the series? Well Love Monster & The Last Chocolate is his third adventure and I’m hard at work on the fourth as we speak…watch this space! What can visitors to Harrogate Children’s Festival look forward to at your event? It’s a fun-packed, fast-paced forty-five minutes. We’ll be reading the book, learning to draw Love Monster and then creating out very own new monster together using as much imagination as possible! There’s even time to make our very own Love Monster puppets to take home. I can’t wait to meet all the children and mums and dads – it’s one of my favourite things about being an author. Are there any Yorkshire sights you’re looking forward to visiting while you’re at the festival? This will only be my third visit to Yorkshire. I was actually walking part of the Pennine way just last weekend, which was absolutely spectacular. Unfortunately this time my visit will be so fleeting (I’m coming up especially for this event all the way from Dorset!) that I’ll mostly be seeing the festival itself. I’ll have to plan another visit soon! If you were planning a get-away-from-it-all holiday, which book(s) would be in your suitcase? This is an excellent question. Unfortunately I always struggle to pick one book and end up weighing down my suitcase with several. The kindle has made for much more bikini space nowadays J. I like to read a mixture of non-fiction and fiction and of course young fiction as well, which I never get tired of. For non-fiction, I’ve been reading all the Tim Ferris books – he’s an incredible guy and a good example of a modern day polymath and I’ve just ordered, ‘I know why the caged bird sings’ by Mary Angelou on recommendation. For fiction – one of my favourites is ‘Papillon’ which I keep meaning to re-read. My favourite children’s book of all time is ‘Neverending Story’ – which I think is really a book for all ages. Micheal Ende was a genius. He said, ‘It is for this child in me, and in all of us, that I tell my stories’. Visit Rachel Bright’s website for more information about her books, illustrations and designs. You can also follow Rachel on Twitter or like her Facebook page. If you’d like to see what else is going on at the Harrogate Children’s Festival, please click here.